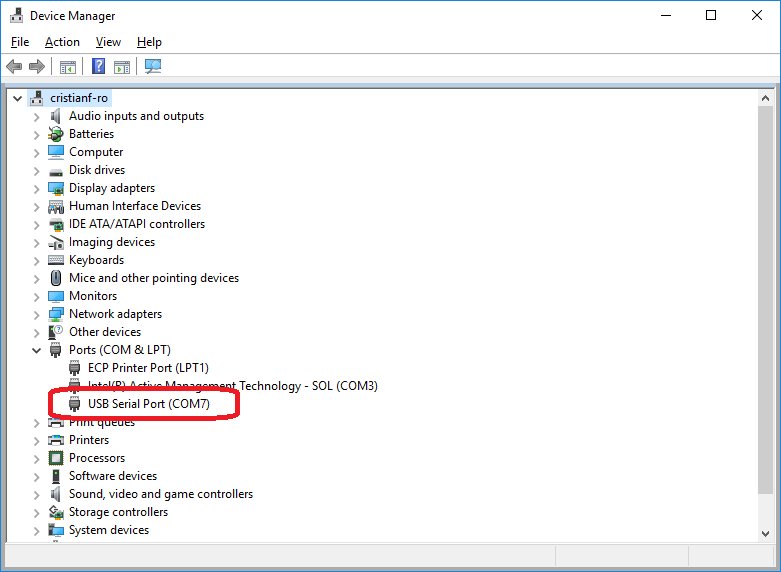 - Serial port: COM10 <--- I checked in the Windows Device Manager. But when I clicked open, nothing happened on the screen. Is there any required step before using the serial port on the PYNQ-Z1 board? Sorry you all for waiting too long before coming back. It seems the problem disappears after I rewrite the PYNQ image on the SD card. I should close this question. We just tried with the image from our PYNQ reference page and it worked fine. Did you try pressing the ENTER key once you opened the terminal to see if you get a prompt? You don't need to wait until the system boots to open the terminal connection. How do you know the system booted? I would try 9600 Baud and use teraterm instead. I assume you use Windows. The standard Pynq image is communicating at 115200 baud rate, so if you use this image you should setup the terminal at this baud. I also noted the previous bug about COM10 port on Windows but still unable to connect with the workaround. 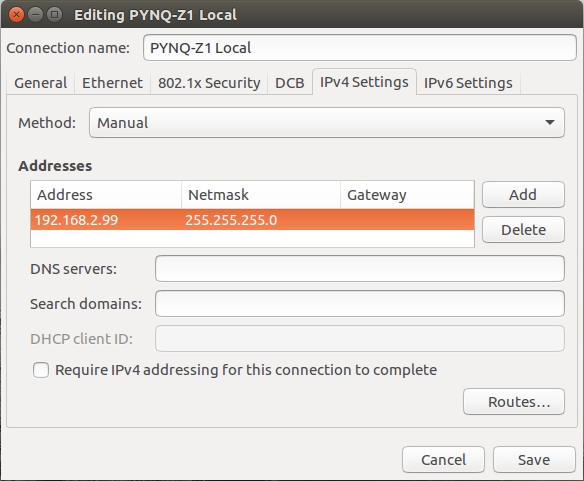 So I tried to assign static IP to my PC and connect to 192.168.2.99:9090 on the browser (with the Ethernet cable now connected directly from PYNQ-Z1 board to my PC). My PC has both Wifi and Ethernet interface. I am not sure if this is the problem. But what I did is, in Ubuntu 16.04 LTS, I turned off the Wifi connection and set the static IP as shown below. Even this I still cannot connect to 192.168.2.99:9090 on the Chrome Browser. Could anyone shed some light? I will get back if I solve the problem. I check the sequence of LED light. I am quite sure the system has booted successfully. (But you are right that we don't have to wait until it has booted.) About the serial terminal, the PuTTy window just doesn't proceed when I clicked "Open". After a minute you should see two Blue LD4 & LD5 LEDs and four Yellow/Green LD0-LD3 LEDs flash simultaneously. The Blue LD4-LD5 LEDs will then turn on and off while the Yellow/Green LD0-LD3 LEDs remain on. The system is now booted and ready for use. The problem seems to be the PuTTY. I just tried with Tera Term and it works. Now the serial port works, but I cannot connect to the board with the Ethernet interface. I just want to use Jupyter Notebook so that I can run code from the browser. Can you give more detail on what you have tried to connect to Pynq? You did a direct connection between your computer and Pynq? What does 'ifconfig' on Pynq look like? What does network interface setup look like on your computer? Can you ping in either direction?